At On-Site Louisville Computer Repair Co. we truly shine when it comes to troubleshooting and installing your file server (commonly just called a server). We do server repair, server service and network service for your business and are ready to deploy fast and on weekends and holidays to rescue your server if it goes down. We are experts at repairing and maintaining your existing server system and we can do a completely new server installation to meet your organization’s needs. We can also help to eliminate a lot of the high cost that is typically involved in a new server installation by providing you with free open source server software. We take pride in being able to work with your budget to develop a server system that meets your requirements without breaking the bank. Call us today at (502) 963-3981 for a free consultation about any of your server or computer networking needs. Business Computer Service Topics – Do I Need A Server? Many small business owners wonder if getting a server makes sense for their situation. Most experts state that any business with more than 5 employees would be better off with a dedicated server network. Installing a server network is not simple, but the benefits are worth the effort. Many businesses make the mistake of adding additional workstations to an existing peer-to-peer network. Many business owners are under the impression that a server is the same as a normal desktop personal computer. However, there are significant differences. Desktop computers are designed to operate complex GUI operating systems, like Windows. Servers are designed to store, manage, and process data 24/7. Servers are created to have a much higher degree of reliability. • You have employees that work remotely. It’s important that traveling or work-at-home employees be able to access important resources and information. • Employees are sharing files between multiple computers. The most useful application of this is “live accounting” where invoices get processed in real time no matter what workstation they’re processed from. • A crashed hard drive would result in the loss of critical data. Servers are perfect for dealing with this problem. 1. Centralized Storage and Shared Resources: There’s no better way to share resources than with a server. This includes access to printers, fax machines, RAID storage, network attached storage devices, cd/dvd towers, etc. 2. Malware Management: A single malware solution is much cleaner, and less expensive, than separate programs on multiple computers. Workstation and server protection can be found in a single package and administered centrally. 3. Centralized Backup: Hopefully, you already backup your business’s data on a regular basis. But backing up multiple computers can be troublesome and time consuming. Having all the data in a central location makes the backup process quicker and more reliable. This can be done automatically during off-work hours. 4. Improved Reliability: Nearly everything about a server increases reliability and decreases downtime. For example, servers often have redundant power supplies. 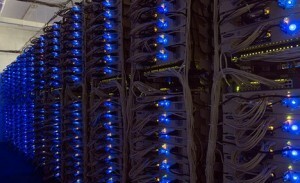 Instead of a single hard drive, servers have multiple hard drives in a RAID configuration. Many components are also hot swappable, so drives and power supplies can be replaced without disrupting users on the system. 5. File/Network Security: Security is perhaps the most important feature of a server. Users can be assigned different access rights. Only the right people have access to sensitive data. Human resources don’t need access to sales figures. The right server and operating system are necessary to gain all the advantages. The choices in operating systems are rather limited. Windows and Linux-based systems are the primary options. Choosing a the right server is heavily dependent on the on a variety of factors, including storage and processor needs, applications, and form factors. A small business server doesn’t require a lot of money or dedicated IT personnel to operate and maintain anymore. If you already have 5+ employees, it might be time to consider a server-based network. For information about file server installation, server repair, server back-up, cloud back-up, data back-up, internet security and generally developing a redundant system to protect your business data and prevent down time call the server specialists at On-Site Louisville Computer Repair Co. today.